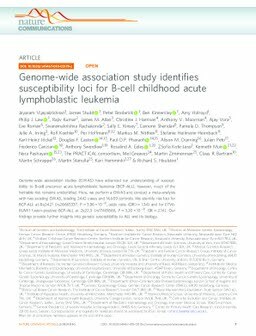 Genome-wide association studies (GWAS) have advanced our understanding of susceptibility to B-cell precursor acute lymphoblastic leukemia (BCP-ALL); however, much of the heritable risk remains unidentified. Here, we perform a GWAS and conduct a meta-analysis with two existing GWAS, totaling 2442 cases and 14,609 controls. We identify risk loci for BCP-ALL at 8q24.21 (rs28665337, P = 3.86 × 10-9, odds ratio (OR) = 1.34) and for ETV6-RUNX1 fusion-positive BCP-ALL at 2q22.3 (rs17481869, P = 3.20 × 10-8, OR = 2.14). Our findings provide further insights into genetic susceptibility to ALL and its biology.